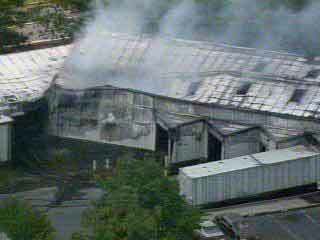 Charlotte, NC-- More than 150 firefighters battled a 4-alarm fire at Reagents Inc., on Sweeden Road around 1:45 p.m. Thursday. The blaze caused extensive damage to the manufacturing and distributing company for hospitals, industries and governmental agencies. Workers at the facility were dispensing a flammable liquid from a large container into a smaller container when a static electricity discharge occurred igniting the vapors. A supervisor called 9-1-1 while some employees tried to smother the fire and use water. All 18 employees at the plant were unharmed, however, three firefighters were treated for chemical burns but were back on duty Thursday evening. Authorities closed parts of several roads near the plant while the fire was being contained, and also recommended that people stay away and stay indoors. On Friday morning, firefighters ripped open what was left of the roof in order to get a closer look at the chemical damage. They said that even though they found some particles in the air, none is toxic. All firefighters who were inside the plant had to go through a decontamination process to make sure that any chemicals picked up at the scene stayed at the scene. Medic was on the scene to monitor firefighters, too. The blaze did an estimated $750,000 in damage. The Charlotte Fire Department Fire Prevention Bureau is reviewing the storage and dispensing procedures used at the facility. Reagents Inc., has not been issued a citation. Hepaco, an environmental contracting service, is in charge of cleanup.